Cass Community Social Services, 1534 Webb, has 40 beds and provides services for families (male and female parents and children). The center is open from 4 p.m. – 8 a.m. Contact the Cass Community Social Services at (313) 883-2277. Detroit Rescue Mission Ministries has a second location with 25 beds for women and children only. The center, 3840 Fairview between Mack and St. Jean, is open from 4:30 p.m. to 9 a.m. For information on this location, contact the Detroit Rescue Mission at (313) 331-8990. Monday - Friday 6 a.m. - 9 p.m.
Monday - Friday 1 p.m. - 9 p.m.
Monday – Friday 1 p.m. - 9 p.m.
Monday – Friday 11 a.m. - 7:30 p.m.
Monday - Friday 6 a.m. 10 p.m.
Saturday - Sunday 7 a.m. - 10 p.m.
Monday – Friday 6 a.m. - 9 p.m.
Monday, Wednesday & Saturday 10 a.m. - 6 p.m.
Tuesday & Thursday Noon - 8 p.m.
Tuesday, Thursday & Saturday 10 a.m. - 6 p.m.
Monday & Wednesday Noon - 8 p.m.
Thursday : Noon - 8 p.m.
Tuesday & Wednesday Noon - 8 p.m.
Thursday, Friday & Saturday 10 a.m. - 6 p.m.
Wednesday Noon - 8 p.m.
Thursday & Saturday 10 p.m. - 6 p.m.
Sunday (Oct -May) 1 p.m. - 5 p.m. Call the Detroit Parks & Recreation Department at (313) 224-1100 for more information. 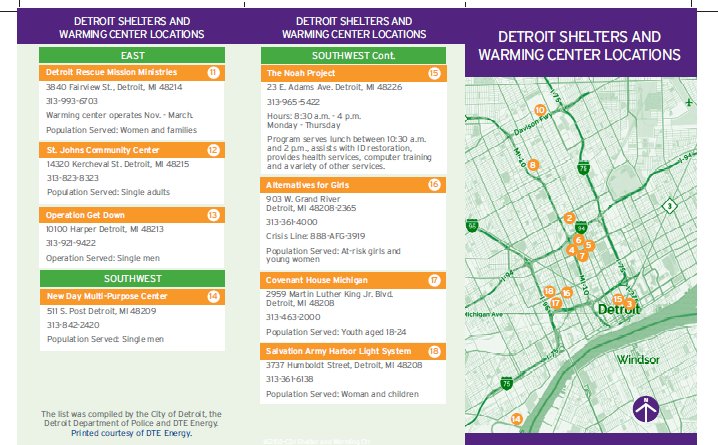 The City of Detroit, the Detroit Police Department and DTE Energy have compiled a list of shelters and warming centers across Detroit that are able to provide shelter during cold-weather extremes. St. Johns Community Center, 14320 Kercheval St., 48215. Contact 313-823-8323. Serves single adults. Operation Get Down, 10100 Harper Ave., Detroit, MI 48213. Contact 313-921-9422. Serves single men. New Day Multi-Purpose Center, 511 S. Post St., Detroit, MI 48209. Contact 313-842-2420. Serves single men. The Noah Project, 23 E. Adams Ave., Detroit, MI 48226. Contact 313-965-5422, hours 8:30 a.m.-4 p.m. Alternatives for Girls, 903 W. Grand River Ave., Detroit, MI 48208. Contact 313-361-4000. Serves at-risk girls and young women. Convenient House Michigan, 2959 Martin Luther King Jr. Blvd., Detroit, MI 48208. Contact 313-463-2000. Serves youth ages 18-24. Salvation Army Harbor Light System, 3737 Humboldt Street, Detroit, MI 48208. Contact 313-361-6138. Serves women and children. Pope Francis Center Detroit, 438 St. Antoine St., Detroit, MI 48226. Contact 313-963-5134. Central City Integrated Health, 10 Peterboro St., Detroit, MI 48201. Contact 313-831-3160. Coalition on Temporary Shelter (COTS), 26 Peterboro St., Detroit, MI 48201. Contact 313-831-3777. Serves male- and female-headed families. Neighborhood Services Organization​ (NSO) Jumaini Center, 3430 Third St., Detroit, MI 48201. Contact 313-832-3100. Serves single adults. Matrix Off the Streets. Contact 24-hour crisis line 313-285-1900. Serves at-risk or homeless youth. Ruth Ellis Center, 77 Victor St., Highland Park, MI, 48203. Contact 313-252-1950. Serves LGBTQ youth and young adults.